No, these are not extra coins found in US Mint collectibles – this time. It’s information from when the coins were first promoted by the US Mint and before the easy availability of information on the internet. That’s right – paper promotional materials from the early 1980s. 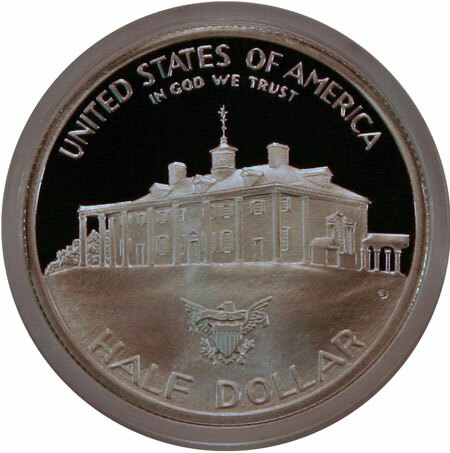 In particular, the information pertains to the George Washington commemorative silver half dollar. Let’s take a look at the promotional material. The Mint uses this quote as a lead to their “firsts” with these coins. They are the first commemorative half dollars since 1954 and the first 90% silver coins since 1964 to be produced by the Mint. The next page provides highlights of the uncirculated George Washington silver half dollar. Looking at the top of this page, the customer bought five of the uncirculated coins at $8.50 each. Another page outlines the proof version of the George Washington silver commemorative half dollar. Again, at the top, the customer noted their purchase of five proof coins at $10.50 each. The bottom of the page lists the coin’s physical specifications and identifies the mint production at Denver for the uncirculated coins and at San Francisco for the proof coins. 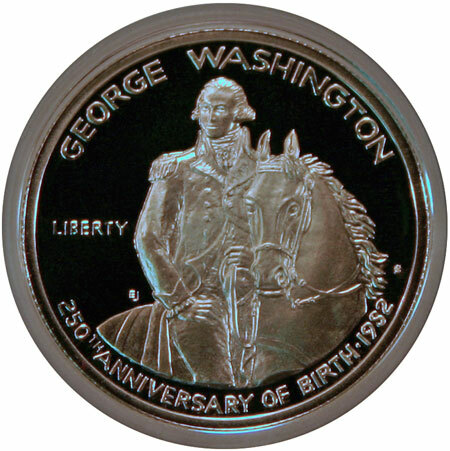 The 1982 George Washington silver half dollar became the first of the modern commemorative coins and is only one of two modern silver half dollar commemoratives. The other commemorative half dollars are made from cupronickel except for the Bill of Rights half dollar. Looking at the packaging for the George Washington half dollar, the US Mint used small, simple boxes to hold the coins – turquoise for the uncirculated and burgundy for the proof versions of the coins. But, rather than the artistic portrayal in the promotional material, what does the coin look like? On the reverse, an eastern view of Mount Vernon forms the majority of the design with an eagle on the front lawn holding an “E Pluribus Unum” banner in its beak, olive branches and arrows in its talons and a shield over its breast. The George Washington half dollar has maintained its value but is not much higher than the original purchase price. Due to the large number of coins minted (2.2 million uncirculated; 4.9 million proof), the coin’s numismatic value has not increased significantly. But, the coin’s silver metal content remains valuable. Because of its silver and its low numismatic value, many of the coins have been sold and melted for their metal content. When melted, that reduces the supply which will not be replaced. If enough get melted, at some point the demand will be greater than the supply thus increasing the numismatic value. When and by how much? That’s unknown. Records of the melted coins are not being kept, and no one knows when the demand will surpass supply. Next Next post: Did you know – Roosevelt Dime?